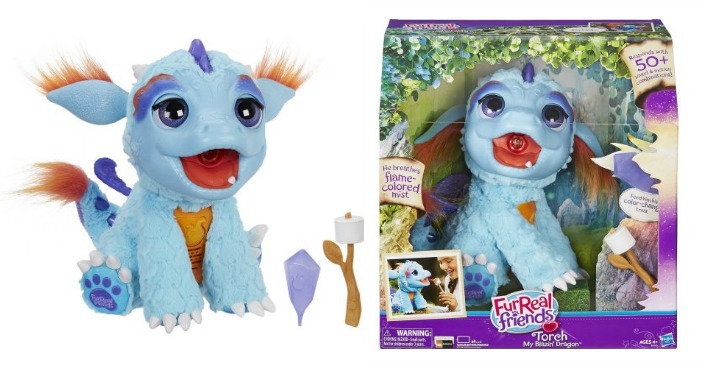 FurReal Friends Torch, My Blazin' Dragon Just $59! Down From $79! You are here: Home / Great Deals / FurReal Friends Torch, My Blazin’ Dragon Just $59! Down From $79! FurReal Friends Torch, My Blazin’ Dragon Just $59! Down From $79! Right now you can get this FurReal Friends Torch, My Blazin’ Dragon for just $59 (Reg. $79) at Walmart! Plus shipping is FREE or you may be able to get FREE in-store pickup! From deep inside an enchanted forest, tucked away in a colorful crystal cave, is a mischievous baby that has come to find his new best friend. Torch is full of fun and surprises! Press his charm and he can breathe flame-colored mist. Feed him his color-change treat! He responds to touch with 50+ sound and motion combinations, too! There’s lots of fun that can happen when playing with this fun, furry pal.